I’ve always been fascinated with death. Yes, I know how that makes me sound. I rarely watch movies or TV that aren’t crime related and, with the exception of travel books, my reading list is a mixture of true and fictional crime titles. When I’m endlessly reading news headlines I will automatically click on stories that report on someone having a less than stellar day after their dearly departed husband has been discovered, buried in a hole beneath the garden decking. Given these odd tendencies it’s no surprise that, as a traveller, I’m drawn to similar visitor attractions. St Patrick’s Church is perhaps not the best example of dark tourism and I’m fairly certain the good people of Glasgow don’t really want it to be a visitor attraction, for obvious reasons. They are a thoughtful bunch. However, should you also be fascinated with locations of a dark nature, there’s no end to the places you can visit throughout the world. This is a list of some of the most interesting places I’ve had the chance to visit. There are quite a few, so I’ve split them into several posts. I was spending a week in Krakow and it seemed like it would be a shame to go so far from Scotland and not visit. I caught a bus to Oswiecim and found that even on the long journey through the countryside, my mood lowered slightly and I was feeling a little worried as to what I would find. One of the first things I spotted was an old disused rail track, which set out the tone for what was to come over the next few hours. I was immediately struck by how close the camp was to the local town as I had assumed, wrongly, it would be out in the middle of a field somewhere, far away from prying eyes. Once within the confines of Auschwitz, you can pick up a guided tour, which are available in a range of languages. There are pretty strict instructions on how you should conduct yourself, particularly in respect of noise levels and photography. 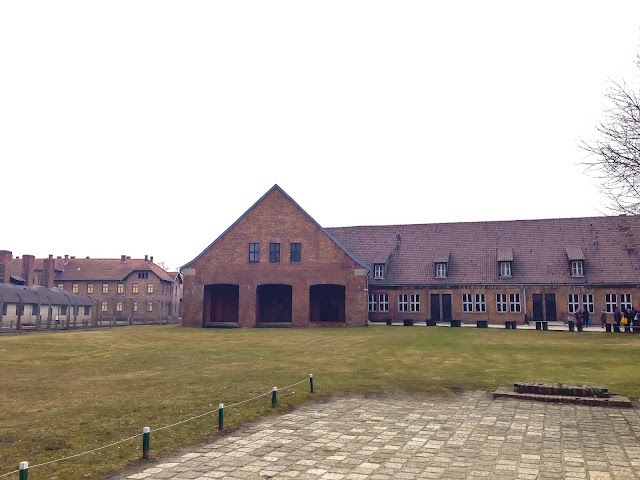 After all, the former concentration camp is a memorial to the horrors of the Holocaust and must be treated with the utmost respect. The guides are wonderful at relaying the stories of imprisonment and, along with the information boards and the walking tour, you can start to get a sense of just how utterly horrific it was. And, just when you think you can't see anything more horrendous, you'll enter another area and your jaw will drop further. It's so quiet and so peaceful that, at times, it was more than my brain would allow me to imagine how truly terrifying it must have been to be held there. I distinctly remember not really being able to speak on the way back to Krakow after the visit because I was so stunned and saddened. It is a must see site from and educational point of view, and in order to pay your respects to the people that were piled on to trains and taken there, sometimes under the pretence of starting a better life. I’d heard the story a million times: ‘you’ll instantly recognise it when you see it’, referencing the infamous site of the 1963 shooting. I was largely unconvinced even though, like everyone else, I have seen the location of JFK’s assassination countless times through TV and movie footage. I just wasn’t sure I’d know it well enough to recognise the place the moment I walked around the corner. I couldn’t have been more wrong. I arrived in Dallas around 6pm and anxiously negotiated the rush hour traffic, desperately trying to make it to my downtown hotel in one piece. Once there and checked in, I wandered down to the front desk to ask how far away I was from Dealey Plaza. Obviously accustomed to being asked the same question, the Receptionist smiled, handed me a map and pointed me a few blocks to the right. As daylight was starting to fade, I initially worried that I would have been better making the trip the next morning, but I couldn’t wait that long. I just wanted a quick glance before returning to visit the Book Depository and surrounding area the following day. I found the Plaza quickly, without using the map, and proved that what I’d heard was absolutely true. It was a strange feeling to arrive somewhere you’ve never been before and feel like it’s not your first time. 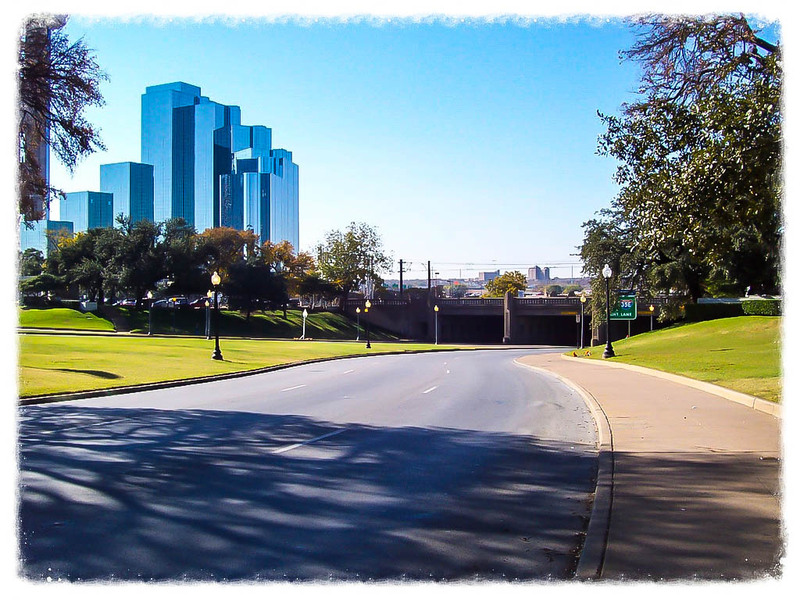 From the Book Depository, to the motorcade route around the Plaza and, obviously, the grassy knoll, it all just looked so familiar. I’d never experienced anything like it before and haven’t since. It was surreal. After a quick look round, I managed to drag myself away. I spent a few minutes watching traffic slowly drive over the white cross that’s painted on the road, marking the exact spot where President Kennedy was shot, and drive off into the sunset. Early the next morning, I rushed back. 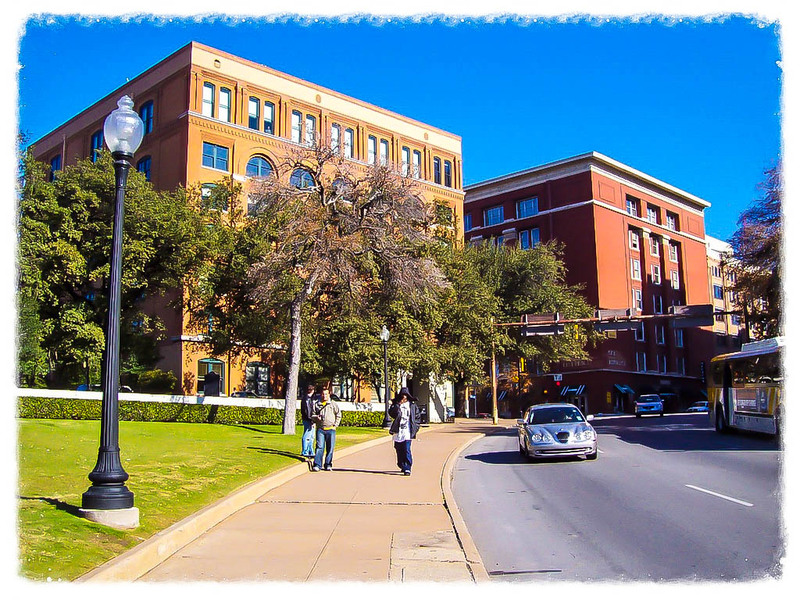 The Texas School Book Depository is now The Sixth Floor Museum at Dealey Plaza and is dedicated to the story and theories behind what transpired on that November day. It is a fabulous attraction, with the pinnacle easily being standing in the sniper’s nest and gaining your own perspective on the shooting. Or, if you’re like me, you could stand there and go: "Really?? Why didn’t he shoot him as he was approaching the bend instead of waiting until he was around the corner?? Surely, that would’ve been an easier shot?? What the hell? ?” But then again, maybe you’re not as cynical as me. And that can’t be a bad thing. Anyway, it is a truly fascinating experience and absolutely must be followed up by a visit to the grassy knoll so that you can solidify your wild conspiracy theories. Do try not to lie on the ground and pretend to shoot motorists as they pass, though. I imagine it’s probably quite disconcerting. One of the most famous residents of Pere Lachaise, and my personal reason for visiting, is the wonderfully shirtless and leather trouser wearing Doors front man, Jim Morrison. I was such a massive Doors fan as a teenager. I think everyone went through that stage. I’m still in mine to a certain extent, although I no longer have his half naked poster on my bedroom wall. The cemetery is easily accessed via the metro and you can pick up a map at the entrance, which will give you the locations of a whole range of famous occupants’ graves. You can then decide who you fancy popping by to see and plot our your journey (pun intended). Some of the graves are truly magnificent and well worth seeing. 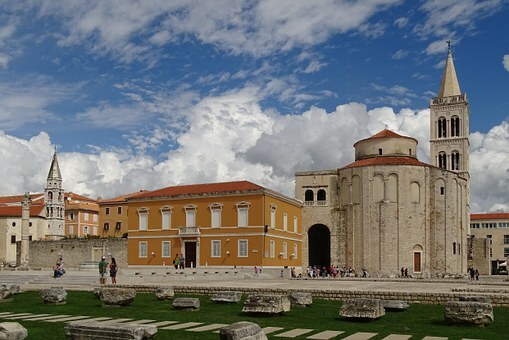 It’s also quite an educational trip as you will undoubtedly come out and spend a the next hour, sitting in a Parisian Café, Googling some of the famous people you’d never heard of. I’m talking about you, Victor Noir. 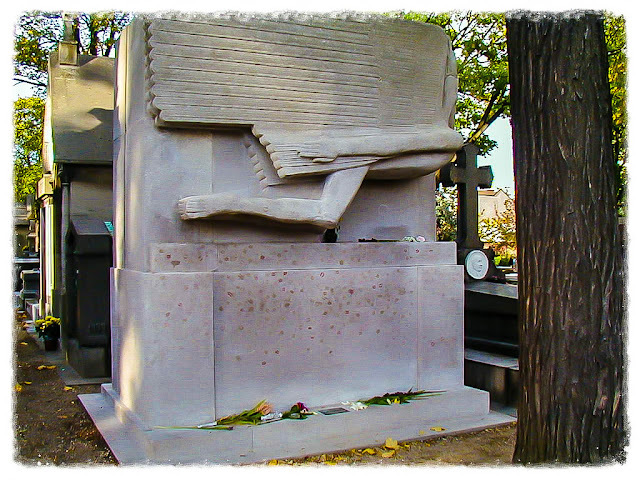 I had, however, heard of Chopin, Balzac, Marceau and Piaf, and enjoyed walking around in the shadow of such talent. 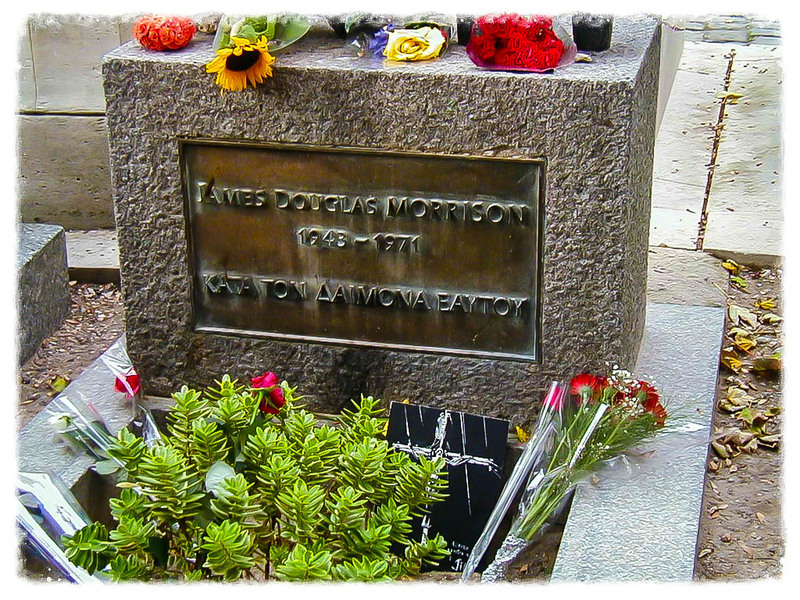 The highlight of the trip, once I finally found it, was Morrison’s grave. I didn’t actually locate it myself, but rather I spotted two Policemen standing guard in the distance and just knew it had to be the only grave that required protection. As it happens, it’s quite the draw for pot smokers, hence the security. Who knew? *Any. I don't kiss any graves.